It seems that Microsoft is racking up its appearances at various events and conferences in an effort to promote its array of mobile applications. After initially demonstrating a number of improved apps at Apple’s dedicated media event in San Francisco, Microsoft CEO Satya Nadella has now made an appearance at the annual Salesforce Dreamforce Conference where he demoed a number of Microsoft initiatives aimed at high-spending business customers. Nadella would have hoped that the majority of the interest and emphasis would have been placed on the fact that Microsoft has a number of products and services that are extremely beneficial to the business world. However, while that may be the case, the focus appears to be on the fact that the Microsoft’s head-honcho employed the services of an Apple iPhone to demo his company’s applications, notably Microsoft Outlook for efficient communications, and Skype for instant messaging and seamless video calling. Nadella was quick to point out that the iPhone being used wasn’t actually his, because that wouldn’t be right now would it? With that said, given the fact that Microsoft continues to inject time, energy, and financial and engineering resources into developing productivity apps for the iOS platform, it makes perfect sense that the CEO of the software giant would take one for the team and show off those apps to their full potential; even if that does involve using the hardware from a smartphone competitor. 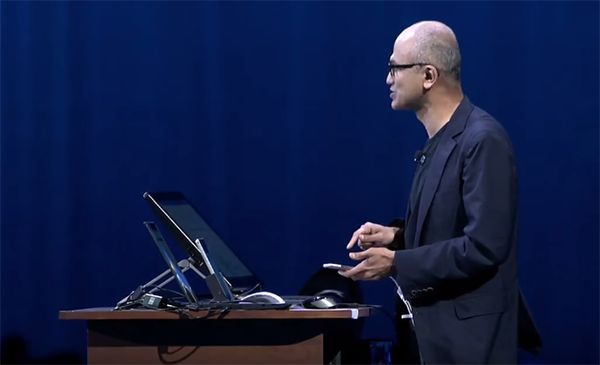 As part of the demonstration, Nadella was keen to stress that by loading the device with Microsoft apps, it turned the hardware into an “iPhone Pro”. We’re not sure what Apple would make of that. Apple’s extremely capable hardware may have been used as part of the demonstration at the conference, but it’s really the power and capability of the apps that stole the show. 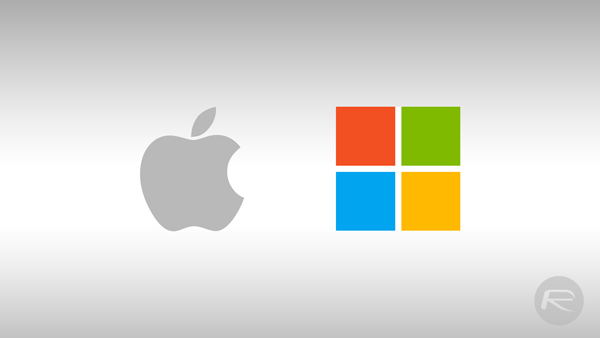 Microsoft’s impressive dedication to releasing, and updating apps for the iOS platform has proven to be quite the conundrum for iOS users when faced with making a choice for a few notable apps. As an example, Nadella believes that Microsoft Outlook is the best email client for iOS, besting Apple’s own native Mail app, and the claim is not that far-fetched either. 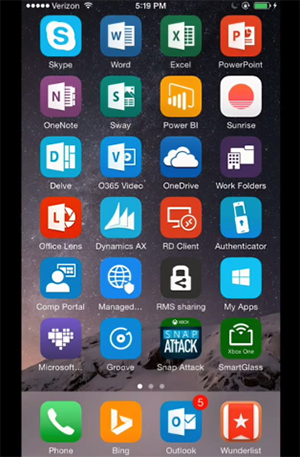 Nadella may use his own Windows Phone “more often” than Apple’s iPhone, but the recent appearance of Kirk Koenigsbauer at the Apple event to demonstrate the Office software on the iPad Pro, coupled together with Nadella’s recent demonstration of Microsoft apps via an iPhone, shows just how much change the technological landscape has witnessed in recent years. microsoft is a software company have nothing much to loose with ditch the hardware lineup and make softwares are the primary and secondary setup. Only thing did wrong was to buy a sick company like nokia. Where I can see this full event? I only use Skype which is not originally Microsoft product on my iPhone to be honest. only faggets and monkeys would cheer smelly JungleSoft on iOS. I see you on every post here. Go back to your cave and shut the hell up please.